With Mars conjuncting Pluto today, you may be called upon to tame your inner beast, meaning that if you feel your emotions rising and you know they may get out of control if you give way to them then you need to reign those emotions in and find another way to express them. Be on the lookout for anyone trying to press your buttons to seek a reaction from you. The white dress shows you as innocent in some way… almost like a blank canvas waiting to see what sprouts forth. Whatever does come forth for you today you can be sure it will not be small. There is an unleashed beast right beside you and you are smiling into its jaws seemingly without a care in the world. Perhaps you should care or perhaps you should have a good look around you and see where the danger really is. You hold the reigns to it’s leash so you know deep down that you are in control and have the power. 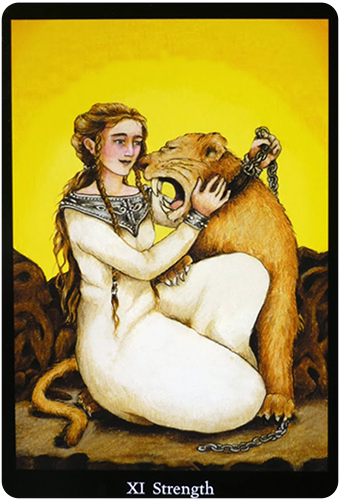 The card used for today’s tarotscope — Strength — comes from the beautiful Anna K. Tarot, by Anna Klaffinger. This deck was originally self-published and is available as such through Anna’s website. Llewellyn has picked up the rights to a commercial version which is available on the Llewellyn website.